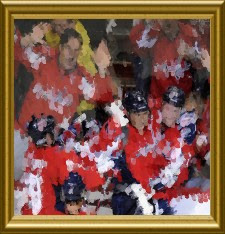 The Capitals just defeated the previously undefeated Red Wings to go to 7-0. I've watched 7 games...not sayin/just sayin...The game was a statement game for the Caps. The statement being, "It's the beginning of the regular season, not the playoffs." After a fun day at an all you can eat crab festival featuring all you can drink Starr Hill beers (Amber, Jomo, Love) I decided to take a nap to rest up for the Caps game. The combo of food/drink hangover messed up my mind. First I woke up at 7pm to my alarm clock and thought it was 7am and I missed the game. Then when I figured it out, instead of waking up I hit the snooze alarm every 10 minutes for an hour. At 8:15 I finally jumped out of bed thinking "Thank God, I only missed like 6 minutes" WRONG. I missed the entire first period and 3 goals! So...I ONLY missed 3 goals, and there were 4 goals left for my viewing pleasure. The Caps just don't stop scoring. They are like Hugh Hefner. They are like James Bond. They are like Paris Hilton. The Caps are the Peter Norths of the NHL. Marjo hit up the scorecard, a few by Green. Perreault got a couple. Can I finish, Can I finish, Can I finish? After going up 3-0 the Caps even decided to play 3 on 5 for a bit, to give the RWs a chance. Forecheck & Cross Check. What are they and am I missing some kinds of checks? Joe B keeps talking about "shots from the Ladies Tee" about long range shots. Aren't the Ladies tee's closer shots! Joe B "thinks" Vokoun outplayed Conklin. I think Neuvy outplayed Conklin and I outplayed him too. I forgot about west coast games starting at 10pm. I hate when the Wizards are on the WC. There appears to be a North Coast road trip in the NHL. Edmonton. Thats more north than the north pole! Why did the announcer keep saying "George, leave me alone!" These "log jams" are boring, how does the goalie stay awake when the puck doesn't move for 60 seconds. When did girls start wearing these UGLY cowboy boots over their jeans. Ladies you look terrible. Am I right Tyra Skanks? 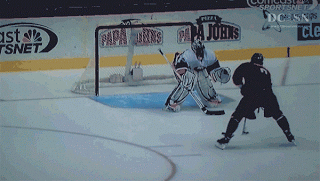 Forecheck = good, cross-check = bad. Forechecking - if a team has the puck deep in their own zone, the opposing team has two options: sit back in the neutral zone and wait for the oncoming rush (commonly known as "the trap"), or put pressure on the puck-holder before the rush starts (forechecking). Cross-checking: when a player turns his stick sideways (horizontally) and smashes another player with it. It's a minor penalty. Love your blog...ironically, I got back into the NBA during the 04-05 NHL lockout. Hope you stick with it throughout the season, because although the NHL season (as the NBA) can drag through the winter months, the Stanley Cup Playoffs are the best sporting tournament in the world IMO. Poke-checking: Pretty self-explanatory, when player A pokes the puck off player B's stick. Chris Conway did a great job explaining. Checking is a very confusing topic in hockey, because it has two completely different meanings. One meaning of "checking" is smashing...from this meaning, you get cross-checking, hip-checking, head-checking...which all describe various methods or targets of smashing. The other meaning of "checking" is to put pressure on someone who has the puck....from this meaning, you get forechecking, backchecking, pokechecking...which all describe various situations or methods of pressuring the puck carrier. In fact, this is where you get the term "the checking line" (usually the 3rd line on the depth chart) , whose role throughout the game is to defensively shutdown the other team's top line. First time reader...I love your blog. I remember when I was new to hockey! Love that you're asking questions...and you're hilarious. The Make-a-Wish kid who was talking to Al Koken or whoever during an intermission said "And now back to George and Craig" instead of Joe and Craig. Since Locker likes to pick on Joe B he just started calling him George the rest of the game. "I forgot about west coast games starting at 10pm. I hate when the Wizards are on the WC." Yeah try being a Wings or Jackets fan. And for the "ladies tees" that probably means between the top of the circles and the mid of the cirlces as opposed to closer to the blue line. And Conklin def was outplayed, but so was the whole Detroit team. As a wings fan I question babcock playing howard on friday and not sat. Seems like a good way to give up. I entertain myself during the logjams (you might also hear them called "scrums") by looking at the position of the players NOT involved, and there are always some from each team. Based on where the players from each team are, you can get an idea of what each team in the scrum is trying to do, and as you get used to watching, you'll note that that translates into clues about what the team as a whole will do with the puck if they win it. Will they try to clear it out along the boards, or will they start a rush up the ice?